“Family comes first” is the motto of UBC Okanagan’s Heather Semeniuk, who is retiring after spending the past 21 years as coach of the Heat women’s basketball team. It hasn’t been an easy decision. Coach Sem says, despite her passion for the game, it is the people and the relationships, not the game itself, that brought her back to hoops year after year. Since 1994, Semeniuk has guided a total of 125 players from 61 different high schools. She credits the arrival of UBC in the Okanagan as a big factor for keeping and growing the program’s diversity. The basketball genes are strong in Coach Sem’s family. She is the mother to four children, all of whom have played basketball. Two of her boys—Darren and Mark—have at one time served as Heat head coach and assistant coach, respectively. Semeniuk’s last matches behind the Heat bench are home games against. Tonight, Friday, February 13, she officially puts away the white board for the last time. Pending the pair of games against the Timberwolves, Coach Sem retires with 376 total conference regular season (196 wins, 180 losses, .521). 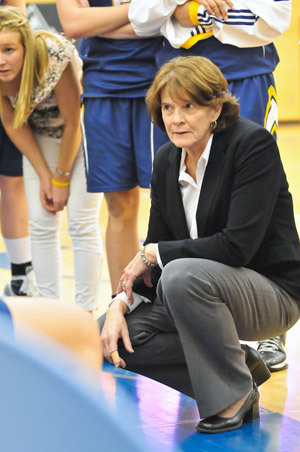 She has been a head coach for 29 conference championship games (16-13) and 10 games at a national championship (4-6). Semeniuk is seen as a great mentor to many who have come through the program, and she has always been ready and willing to help where she can. She admits that her role as a mentor has grown as much as her coaching style and knowledge of the game. It’s largely built on trust. Twenty-one years is a long time for anyone to remember all of the details therein, but regardless, Semeniuk stresses her memories and her legacy will rest primarily on the shoulders of her relationships and experiences with everyone she had the opportunity to interact with along the way.